Offering you a complete choice of products which include jewellery box. 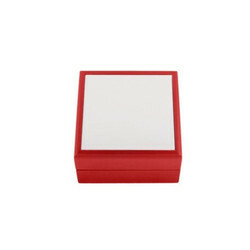 Made of fine wood artistically painted in bright red, this box makes a fine Jewellery Box. With a suitable ceramic tile placed in the centre it can be printed with your beauroful designs, images or photos by Sublimation printing. Each tile is coated suitably for sublimation heat press printing to enhance each image and make it vibrant.